The Shinto religion or way of life in Japan honors the divine in all its entities. The word for spirits or gods or essences is "kami". Kami can be manifested in all of nature, places, and even people. I suspect that it is because of that belief that there is so much reverence for nature and the world here in Japan as its people recognize the divine in almost everything and everyone around them. There is even a word in Japanese for a forest bath - shinrinyoku - taking a walk in the forest for its restorative benefits. This is also noticeable in the way that the Japanese celebrate the changing of the seasons, including the falling of the leaves, and the blossoming of the flowers. In one year here, I feel more aware of which months feature which blooms than I ever did in D.C., except for cherry blossoms. Here, one garden may have cherry blossoms in April, but another has wisteria in May, or irises in June. They advertise and host festivals around these events and celebrate their beauty. The changing and falling leaves in autumn is no exception. In the Tokyo area, the most dramatic leaf changes are in early December and many parks host what some Americans refer to as "leaf peeping." 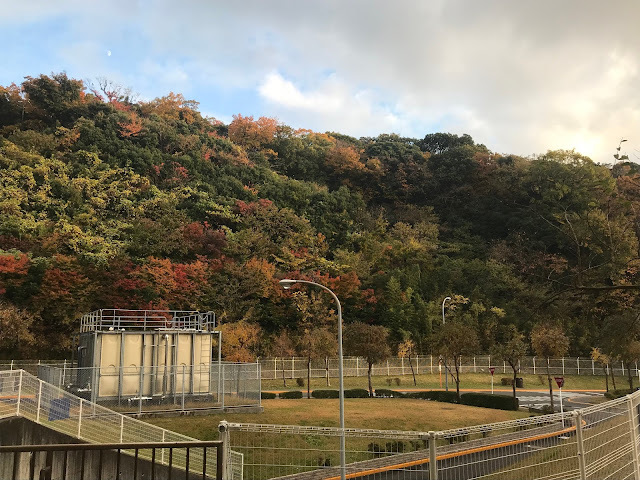 One of the best places for viewing autumn colors is at the Imperial Palace, which opens up one of its streets only two weeks a year - once for cherry blossoms and once for fall leaves. Until this December, the street had actually been closed for maintenance for the last 18 months, so it was even more of an exceptional treat for a friend, her two kids, and I to go check it out! On Saturday, Blake and went for more autumn color viewing at Sankeien Garden in Yokohama. We've been trying to go here for all sorts of blooms or events all year, but for whatever reason had to keep changing our plans. Not only are there amazing leaves and other flora, but several historical buildings from throughout Japan have been moved here for historical preservation. We are so glad we finally made it! My favorite view of the autumn colors is right outside our dining room. This hill is beautiful all year round, but its at its best in the fall. I think more of us would do well to recognize the divine in everything and everyone around us. Because it is there. I certainly felt edified looking at your photos. Thank you for sharing them.